First Clan Donald Service at Iona Abbey for 500 years? The existing medieval Abbey and Nunnery buildings on St Columba’s Iona are the legacy of Clan Donald’s (Lords of The Isles) rich Sea Kingdom and power, early stone castle and monastic building and their unrivalled endowment, patronage and benefaction throughout 1200-1500. Following their destruction by the Campbell led Reformation and civil wars in the area 1500-1700, the ruins underwent a century long "resurrection” from 1900 by the visionary Rev MacLeod and the self funded Iona Community. Historic Scotland has managed the site from 2000 and is now planning to "re-interpret” the site. 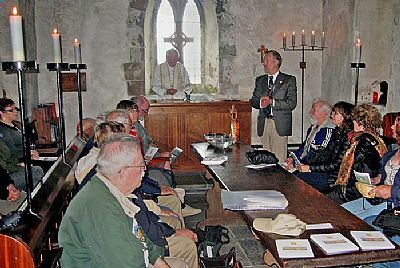 Clan Donald members came from around the globe to hold their first service on the site for 500 years in Michael Chapel which was the first and only building completed around 1207 at the death of the re-founder Reginald, the father of the clan’s eponymous Donald I. A special service was eloquently delivered by Murdoch MacKenzie, Iona Community, with evocative hymns sung in Gaelic by local Morag MacNeil (left top). Ian Macdonnell, Australia (standing right) who originated the Iona tour and service delivered a short history of Clan Donald’s monastic and monumental heritage on the site. In this 600th anniversary year of the Battle of Harlaw (Ross), a small re-enactment by Ian and Murdoch witnessed the giving of a representation (on table) of a reliquary, the gold and silver hand of Columba, donated by Chief Donald (II) of Harlaw to the Abbott, John MacAllister, c.1412. Donald’s son Angus was the Bishop of The Isles. Ian also proclaimed Donald of Harlaw’s unattributed grave slab, the last Lord laid in the same "sacred storehouse of his predecessors”, St Oran’s Chapel, Iona. (and Reginald’s and Angus Og of Bannockburn fame).